On the last page of “The Winding stair” me thinks…. It all started as usual. I was on my way to the railway station, and I was early that day. So i headed for my favorite place – the second hand book store. 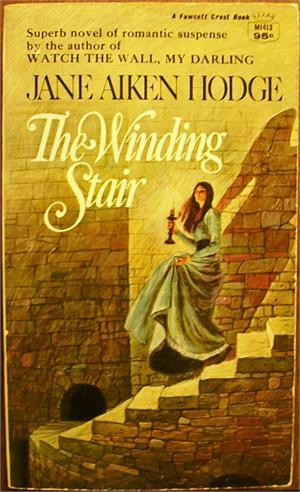 There I found the book “The Winding Stair”, by Jane Aiken Hodge. I started reading it in the train itself. By the time I reached home, I managed to read out a couple of chapters. The story is about a damsel in distress (lemme put it that way), named Juana. The story opens with the suicide attempt of the heroine. She tries to jump from a small bridge and, Mr.Gair Varlow, the hero comes for the rescue (I know I don’t need to add hero here. still for the sake of the readers). And the best part is, she tried to commit suicide juz coz she had to play the part of viola from the celebrated play of Shakespeare “twelfth night”. Not to mention she got stammer. The curious part is that she stammers only in English. (Oops sorry I forget to mention she is half Portuguese and knows it well ;-)). Well he manages to take her back to the play. Then it’s revealed that he needed her to do something for her and he writes to her grandmother in Portugal to call her back there (He knows her grandmother since both of them work for English government ,you guessed it, spies). Well the damsel in distress goes to Portugal in the next favorable wind and she finds her sick grandmother and her purpose there. Here comes the winding stair. It’s the secret stair from the old lady’s room to deep down the castle of the rock (the castle of rock is where the grandmother lives).underneath the castle lies the meeting place of the notorious sons of the stars. Her duty is to open the doors for the members and lock herself in a cell (she is not allowed to hear their discussions), and to lock after the discussion is over. But her real purpose is to listen to their discussions by opening a secret panel in her cell. She is accompanied by her two uncles and a mad Aunt Elvira (a nice name, never heard it and I don’t think she is mad). She has two cosines. They are the men of the prince and the princess (lots of politics in this part).Things go well for her, she witness a number of meeting and the hero or shall I put it the knight in the armor comes the following morning to hear the whereabouts of the meetings. The story goes on to tell his attempts marry her and Mr. Varlow’s attempts of protecting her and the secret society’s terrifying intentions. The opening is juz like any other historical romance, a couple of chapters proves that. But moving on we find more and more intrigued to know what actually got our damsel to come to Portugal. To her grandmother, who disinherited her father, calls her back from England. We’ll be surprised by the damsel’s logic and her reasons of actions. She takes up everything without asking much questions and best of all, she do think about it deeply and she do share the same thoughts of the readers. But the thing that I didn’t understand is that how she comes to take up everything even the biggest revelations without a shock. The author do tries her best to keep up the suspense and she does succeed to some extent. But the reader finds their enthusiasm lessened as they turn each page. She drags the story by adding more about the notorious and terrifying secret society which plans on its own government. Chapter from 9 to 15 is a mess. Its gets you to the last level of patience. But as soon you get to chapter 18 “a change in wind, says I” (borrowing without permission (as quoted by Capt. Jack sparrow) the lines of Mr. Gibbs for Pirates of Caribbean). This part of the story shakes you. You are really surprised, coz you find yourself eager to find what happens next. You suspect each and every one of the novel to be the villain. She does have the credit on this one. But the part I didn’t get on well is that, she portraits Aunt Elvira not to be mad and she warns the damsel of the threats and dangers, but doesn’t tell about how she came to know all about it. Also nothing about her is told in the end. It’s left like a loose string. The readers do have lots of questions at the end unanswered. It looks like the author was in a hurry in wrapping the novel to the end since she dragged it enough in the middle. So ME THINKS…… 2 out of 5 stars… read it at your own risk (if you have a great deal of patience). Previous postmy very first words…..